VitaStim Grease – FOG Reducer contains bacterial cultures along with key bio-vitamins and bio-stimulants. Excellent for chewing up high levels of grease and fatty acids. This product will reduce grease, filaments and sludge production and control foaming. These culture concentrations are five times higher than are available through catalogs or local supply salespeople. VitaStim Grease – FOG Reducer contains specialized bacillus cultures that are very productive in aerobic environments where foaming or acid conditions may occur. VitaStim Grease is the answer for three things related to methanogensis and anaerobic digesters. First, VitaStim Grease – FOG Reducer is very good at the two steps which are often considered to be bottlenecks. Bacillus accelerates the overall process to help move the process along. Second, VitaStim Grease – FOG Reducer aids in the breakdown of amino acids to ammonia, but they in turn can assimilate the ammonia. If kept in balance, it helps to remove ammonia which can be toxic to anaerobic digestors and methane production. Finally, the micronutrients and biostimlants blended in VitaStim Grease – FOG Reducer will help to maintain the balance of the digestors to make them more efficient. The control of the pH is also very important here. The only thing to be careful of is adding too much product and too high micronutrients. If it is a fixed film anaerobic digestor, this products is used at very low dose rates or .01 to .1 ppm as we do not want the film to sluff off. A wastewater plant at a rendering facility has very challenging nitrogen and phosphorous compliance limits. 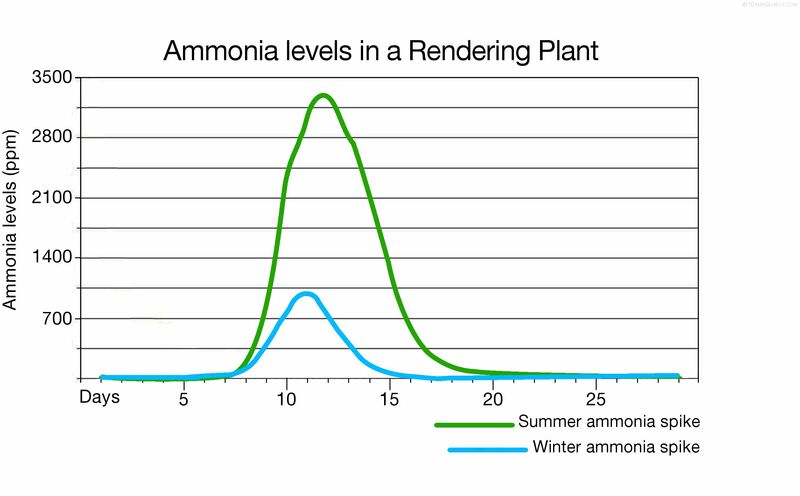 Depending on the temperature, and how many chickens they get in, ammonia levels can be 1200-2500 mg/L and BOD 9000-20000 mg/L. When they get hit with nitrifier-killing toxicity, they restart with our VitaStim Dynamic Duo. They used VitaStim Grease to chew up extra grease. VitaStim Dynamic Duo brought the ammonia back down fast to the compliance limit of 3 ppm or less. See Graph in new window.